©FAO/Giulio NapolitanoThere are more than 1900 edible insect species and the most important ones are in the orders of Coleoptera (beetles), Lepidoptera (butterfly and moths), Hymenoptera (bees, wasps and ants), Orthoptera (grasshoppers and crickets), Isoptera (termites), Hemiptera (true bugs), and Homoptera (cicadas). 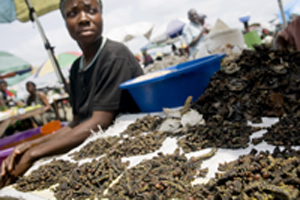 Reliable figures mention the consumption of 250 insect species in Africa, 549 in Mexico, 180 in China, and 160 in the Mekong area. Although Japan is not a tropical country, a number of insect species are popular food, in particular wasps. 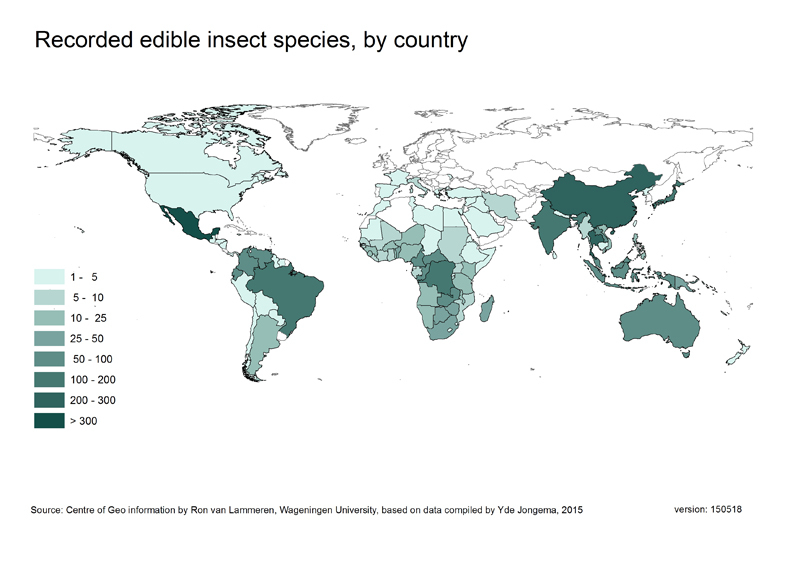 Yde Jongema, taxonomist of the Laboratory of Entomology of Wageningen University, has compiled a worldwide list of edible insect species using a number of literature references.